For many years, well into the 1960s, in fact, rock'n'roll followed the time-honoured tradition of the package tour to play to audiences around Britain (it was a concept that was followed in America, too). The idea was quite simple - assemble a couple of big names, some lesser ones, and send them out to play in theatres all over the country. The relative unknowns would receive exposure, the stars would play a few of their hits, and everyone would go home happy. The package tour of rockers was essentially just an extension of the old music hall idea of sending a number of acts on tour together. It was believed to represent value for money for the consumer (which meant bums on seats), and lower overheads, which together translated into bigger profits. 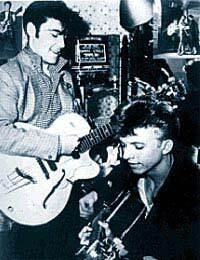 The first of the British rock tours really came with the rise of Tommy Steele and those who followed him (Lonnie Donegan had toured, but there was really no one to add to a package with him when skiffle was new). They proved remarkably successful, performing a series of "one-nighters" around the country to screaming audiences. As new stars came forth, they had the chance to headline their own packages, although they'd probably have served apprenticeships lower down the bill first - in fact, at the first sign of any public interest, a new act would be added to a package. In the case of Billy Fury, he auditioned for a promoter, went on the bill that same night, and was added to the rest of the tour. There were also a couple of other ideas propelling the idea of packages. The first was that no one star was big enough to fill a theatre alone, and secondly that rock was a passing fad, so getting them out and making money while it remained hot seemed merely sensible in business terms. It didn't matter how big you were, you went out on a package tour controlled by the big impresarios and promoters. Even the Beatles, as they first rose to fame, played the packages - there was no other game in town. The Beatlemania phenomenon of 1963-66, with its hysterical, screaming fans is often cited as something unique. But the truth is that it existed, on a smaller scale, in the 1950s. There was plenty of noise and screaming in every theatre a package tour played - so loud that it actually scared some visiting American performers. Of course, the extreme fan reaction brought condemnation from some establishment figures, but success meant the packages would keep going out and giving teenagers what they wanted, even at the expense of slashed theatre seats (a common phenomenon) and some violence. However much hand-wringing went on, it became more apparent that rock was here to stay. These days headlining bands have luxurious buses for travel and stay in top-class hotels. Things were different in the 1950s. Even the major acts travelled in vans, and accommodation was in the old-style theatrical digs, with their rules and fearsome landladies. Whilst this cut down on expenses, it made the touring process a lot harder for performers - more endurance than enjoyment, especially as even the biggest names had no more than 20 minutes on stage each night. The package tour proved a strong idea well into the 1960s - in 1967 they were still going. But the idea that you needed a host of names to sell tickets had been proved wrong by bands like the Beatles and the Rolling Stones as they became more famous than anyone had imagined, and rock had become so established, and so profitable, that it could make its own rules. The biggest factor, however, was that rock had become more serious. Audiences wanted longer performances from the people they'd come to see, and the bands themselves wanted to perform longer sets. Instead of six or seven bands on a bill, the number dwindled to two or three, and the audiences kept coming. The new model made money and stuck (notably, though, the package never died completely - you still find packages of nostalgia or revival acts on the road), until it's become the norm these days.